Marc Goodchild is a multi-award winning digital executive who has been at the forefront of many TV industry innovations over the last 20 years. Having originally trained as a journalist, he cut his teeth in television working at the BBC’s Children’s department where he directed and produced for several years before moving to Disney Adventures in the UK. 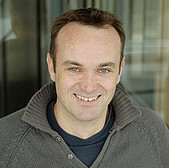 In the late 1990s he was one of the first producers to develop fully integrated web-TV properties (that we now call transmedia) and in 2001, won the first ever interactive TV Bafta for his pioneering work on the CGI franchise Walking with Dinosaurs – the world’s first interactive TV documentary. He subsequently headed up BBC Factual’s cross-platform portfolio and in 2006 took over as Head of digital services for CBeebies and CBBC (responsible for developing the two Children’s iPlayers and driving the department’s product offering across web and mobile). In 2011, when Children’s BBC moved to Manchester, Marc returned to the commercial sector where he has advised on major innovation projects for Lion TV, Zodiak and Jamie Oliver’s Fresh One productions. He has helped develop and launch an SAAS second-screen delivery service and is currently Product Director for Gingersnap, a mobile-first story-app gifting platform aimed at children and their grandparents. He is a regular speaker on broadcast innovation at conferences worldwide and advises pro-bono for the Children’s Media Foundation on all things digital from OTT services to online-safety.